The most common version of the Marx Presidents sets is the supermarket promo shown above. It may have also been available as a gas station promo as well. This set was available via an in-store promotion where a new figure was released each week. The set was also sold complete as a mail-in offer. 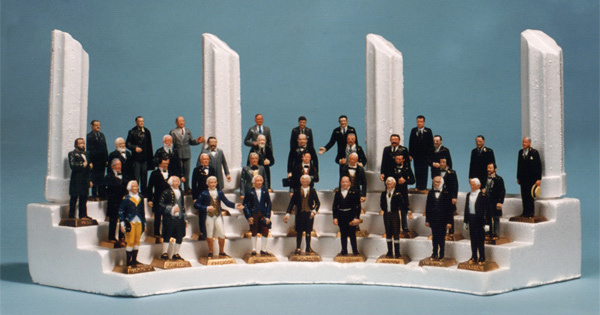 The complete set included all painted Presidents up to Nixon, including Lyndon Johnson and John F. Kennedy. The unique multi-tiered Styrofoam base with columns was provided to display the entire series.